According to Travelocity, you can only fly from San Francisco to Puerto Escondido (on the Oaxaca coast of Mexico) by making two 3-hour layovers, the first in Guadalajara or Dallas/Ft. Worth and the second in Mexico City, from which you connect to the once-a-day MexicanaClick plane to Puerto — which drops you off at the friendly little Puerto airport and then sweetly turns around to ferry a load of passengers back to Mexico City. (MexicanaClick is Mexico’s first budget airline, and this is the only plane that goes in and out of Puerto Escondido). But when we went last month, you could do it via one 8-hour layover in Mexico City’s chilly, inhospitable Benito Juarez Airport (the chilliness because Mexico City is 7300 feet above sea-level; luckily, I was reading a spectacular book, Kate Atkinson’s Case Studies — more about which later in this post). Routes and schedules may well have changed again when you go, of course, so don’t take me as a travel adviser — except, perhaps on what to read (like Atkinson’s wonderful novel, which will probably stay in print for quite a while). My friend Barbara Schaffer, who lives in Puerto Escondido, goes home differently after a visit to the San Francisco Bay Area. She flies to Mexico City, takes a cab (an authorized cab, click here and scroll down to learn more about them), checks in to a hotel to nap for a few hours, and then takes a 12-hour bus ride home to Puerto. Cheaper, she says. It helps if you speak Spanish, I reply. Which she does. And teaches it — and English as well, to Spanish speakers, on the shaded patio of the lovely little house she’s had built for herself in Puerto. But Barbara — who writes poems, song lyrics and travel stuff about Mexico (on her own website as well as as at the local Puerto magazine El Sol de la Costa) — enjoys improvisation, at least in traveling and sightseeing. Though not, I should stress, when building her house. Her online essay, A House in Puerto Escondido, is rich in detail, planning, and savvy: essential reading, I would think, for anybody considering building her or her own retirement or vacation home in Mexico, and most particularly anyone doing it on a budget. And the house, btw, (where we stayed with her for the week of our visit) is exceedingly well designed and thought out — not to speak of comfortable and delightful. It was just when we set off in a leaky canoe onto Lake Chacahua that I wasn’t so delighted with Barbara’s improvisatory mode. But more about that in a upcoming post. Because (just as I like to tell you what my romance heroines are reading) I want to put in a huge plug for the genre-busting mystery novel (as Laura Miller calls Case Histories in her 2004 capsule review in Salon.com) that made an 8-hour layover in a chilly airport almost a treat. Heartrending, smart, and sometimes very funny, Case Histories links together multiple mysteries, its four murders nesting like Russian dolls (as Stephen King put it when he called it the best mystery of the decade) . King defies any reader not to feel a combination of delight and amazement when the mysteries begin to fit together; and if Stephen King read it once for pleasure and then again just to see how it was done, you can imagine what pleasure and fascination I found in a book that crosses the borders between literary and genre fiction, and tells us a little more than we knew when we started, about what draws us in on each of these journeys. But come back soon, for more about my own journey — as the plane lands and I step into that leaky canoe. (And if you want to take Spanish or English lessons from Barbara, you can reach her through her website; email her at espanol@speakeasy.net; or phone her from the US: 52 01 954 582-2993). Written by Pam on February 8, 2009 at 10:15 am and filed under Travel, What I'm Reading. 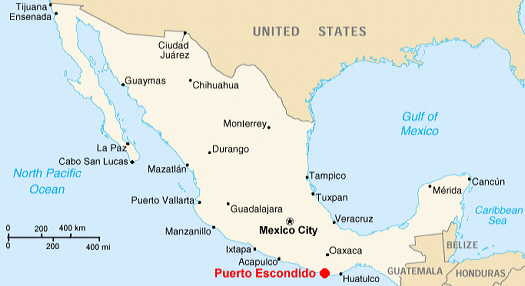 Glad you liked Puerto Escondido. My maternal grandmother was born in Oaxaca City, so I’m a bit biased, but I think Oaxaca is truly paradise on earth. I think you may be right, azteclady, about Oaxaca (and it’s interesting to learn the provenance of your online name, too). We loved Oaxaca city when we visited it some years ago (the two little painted cats we bought there are probably what I’d grab first if the house was burning down), and I’d love to go back when next we visit Puerto Escondido. The Aztecs (aka Mexicas) lived in Central Mexico, where Mexico City stands to this day. My maternal great grandmother had some Mixteca and Zapoteca blood (both cultures from the Oaxaca mountains), but no one would have known or understood the significance, had I chosen either for my online name… Hence, aztec. Thanks for the CASE STUDIES tip, Pam. It looks like a great book to check out. Of course, I still need to carve out time for THE EDGE OF IMPROPRIETY. It has been sitting on my bedside table for a few months now, awaiting a week without heinous deadlines so I can relax with it and savor it rather than grab it in fits and spurts. Such is the world of the working mother of a preschooler! Oh, and my layovers? I just don’t go anywhere that requires them — not with a three-year-old. I envy you! I certainly understand the conflict between longwinded clarity and easy recognizability, azteclady — and probably so do most historical writers. Thanks for the real info.